FOMET is one of the world-wide leaders in the field of induction melting furnaces and leading specialist in systems for automatic pouring. FOMET, thanks to its 50 years experience, are leaders in the field of planning and production of induction furnaces for the most varied applications in ferrous and non ferrous metals. Research studies and formulation of our own manufactured refractories, as well as equipping the furnaces with the most advanced control process systems, has achieved significant energy savings making FOMET installations more efficient and economical than ever. The efficiency and reliability of our furnaces is backed up by a fast and direct technical support service, able to satisfy the entire customer’s maintenance demands and spare parts requirements. These services make FOMET a true PARTNER and extent peace of mind to our many clients. Refining furnaces for the production of ingots or billets. Twin chamber channel induction for melting and holding brass and bronze. 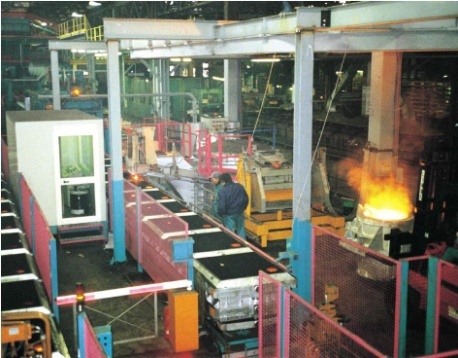 Tilting furnaces for melting and direct casting of brass and bronze. CORELESS INDUCTION FURNACES for melting, holding and superheating. 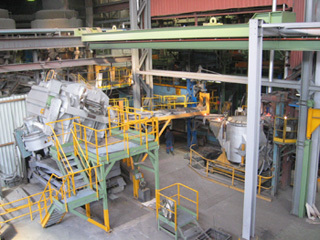 PRESSURE FURNACES for the automatic casting of grey iron and special cast irons. DUPLEX channel induction furnaces for holding and superheating of any type of cast iron. High efficiency, flanged and INTERCHANGEABLE INDUCTORS, cooled exclusively by AIR up to 500 kW, and by WATER for higher powers. Integrated computerised management systems of ”PLC” and ”PC” with dedicated FOMET SOFTWARE. REFRACTORY LINING of our own manufacture, for our furnaces, give SIGNIFICANT SAVINGS IN ELECTRICAL ENERGY CONSUMPTION.